It is possible to develop arm muscles when you are making bread or pastries. How? Because of all the kneading that you’d end up doing. Many would agree that kneading dough manually is one of the more demanding steps of the preparation process for pastries. It’s also one of the more time-consuming. Imagine if you could breeze through that step with almost no effort and in a shorter time. Thanks to dough blenders, now you can. What is a Dough Blender? The word ‘blender’ may bring to mind a device with a large glass container where you mix in ingredients and then push a button for them to be mixed or blended in. This time, however, we are talking about a different kind of blender. A dough blender, or a pastry blender as it is also commonly known, is a handheld utensil used in pastry-making, where solid fat (usually butter, margarine, shortening, or even lard) is mixed more easily into flour or even already kneaded dough. 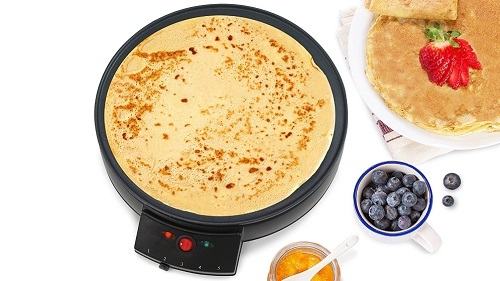 Usually, it is designed with a handle that has thin metal wires or tines that easily cut through butter and slice it into small pieces for easier mixing into the dough. It is very similar to using the tines of a fork to break butter down and mash it in order to allow better integration into your dough. In some cases, others may use a couple of knives and cut up the butter, usually in a crisscross manner, then pressing the pieces into the dough using the back of a fork to mix it all up. 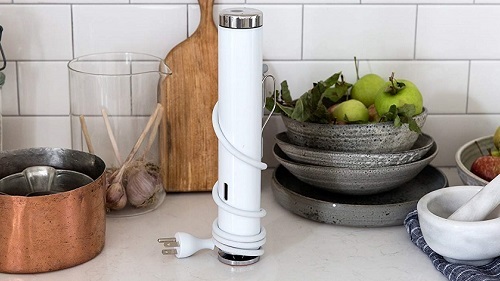 With a dough blender, you can ditch the knives and the fork, and use a single tool to complete the task of cutting the butter and mixing it into the dough. Obviously, a dough blender can make your life easier when going about the tedious and tiresome process of mixing and kneading of dough. It is definitely easier on the hands since you don’t have to put too much effort into gripping knives or forks so you can cut the solid fat and then mix them into the dough. The dough blender’s thin tines will do the job of breaking down the solid fat for you into smaller pieces. Think of when you have to create multiple batches or large servings of pastries. Without the aid of a dough blender, you’d most likely end up straining your arms. The saddest part is that this is just one step of the whole process of preparing bread or pastries. If you spent all your energy on this single step, then you are in for a rough day. Using a dough blender also makes a smaller mess when compared to using your hands. There are fewer utensils to use and, therefore, fewer items to clean afterward. If you are working in a cramped area on your kitchen, or you don’t have any of those wide countertops usually used by professional pastry chefs, you’d appreciate how handy and space-efficient this tool is. The major classifications depend on the attachment on the handle: either the dough blender has those tines that are as thin as blades, or it is designed with thin wires. They work the same way and often show the same results. However, there is a general preference for the blade types since they are generally sturdier and more resilient against wear and tear. In addition, the blades are also much easier to use in cutting and breaking down solid fat more than the wire type ones. 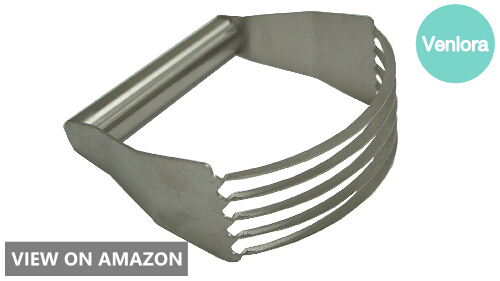 Most people think that such a simple yet efficient handheld pastry tool won’t require a lot of thought when shopping. After all, what major differences could the many types of dough blenders have? As it turns out, there are several considerations to be made, and here we present the five best dough blenders you can choose from. 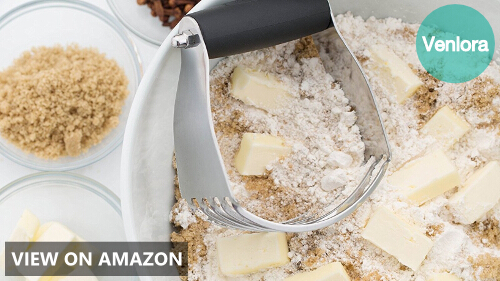 This pastry blender from OXO has five stainless steel blades that effectively cut butter or margarine and blend the sliced parts into dry ingredients for easier mixing and kneading into dough. Handling it is easy and painless, thanks to its soft non-slip grip, which acts as a cushion and absorbs pressure off your fingers and the palms of your hands. Since it is dishwasher-safe, it is easy to clean and store after use. Just by looking at this dough blender’s stainless steel construction, you know that you’ve got a no-nonsense device in your hand. All 5 stainless steel blades are obviously made for precision cutting and blending, making it excellent for cutting and subsequently blending dry ingredients. 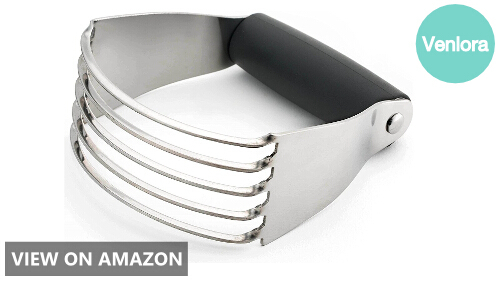 So if you are looking for a pastry blender for dough, butter and crumbling, this utensil may just be what you need. 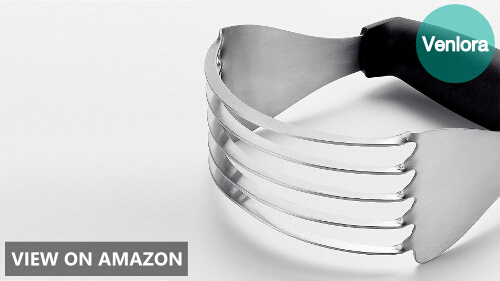 Own a professional pastry cutter with this utensil from Spring Chef. The high-quality stainless steel blades are thick and heavy-duty, so you can be sure you will get a lot of years’ use out of it. 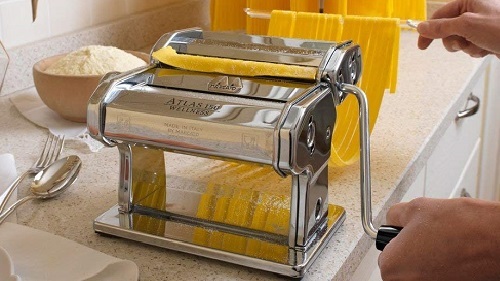 In no time at all, you can come up with uniform cuts of butter or margarine that are thoroughly mixed in your flour. 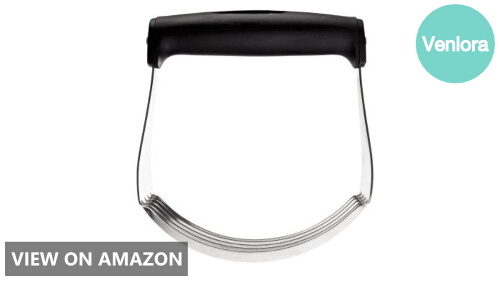 Here’s a plus: the blades can also be used to chop fruits, some soft vegetables, or even nuts! Its soft grip handle is large and comfortable enough so you won’t feel any strain on your wrists and fingers even after working on large batches. 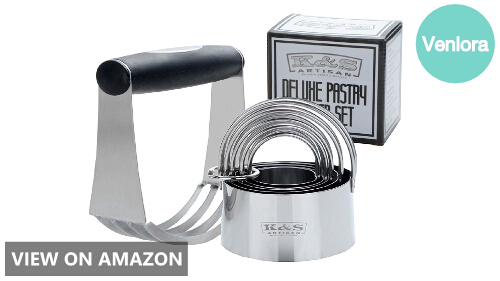 From cutting biscuits and cookies to blending dough, this K&S Artisan Pastry Cutter Set can do it all! 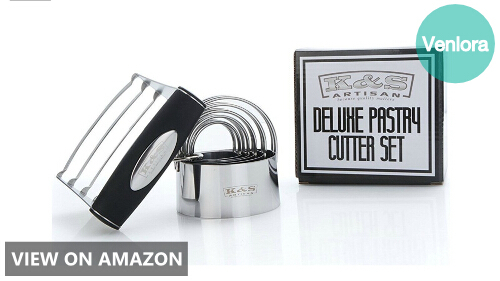 You’ll definitely feel like a professional baker with this pastry cutter set. As a dough blender, it offers a comfortable grip, thanks to the ergonomic rubber non-stick handle. 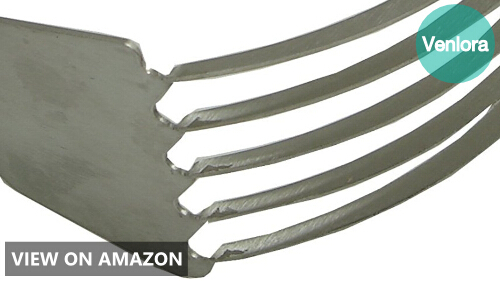 The food-grade stainless steel blades are rust-proof and easy to clean, as well as highly effective in cutting through hard and sticky dough. Aside from being a dough blender, it also has 5 cookie cutters with handles, and they come in graduated sizes for more versatility. That way, you can make a variety of pastries, including cookies, biscuits, scones, tarts and more! If the large version of Spring Chef’s Dough Blender is much too big for your taste, then you can go for the medium one. It has the same professional quality and heavy duty stainless steel blades in a more compact and lightweight version, making it easier to handle, even for prolonged periods. Wrist fatigue is prevented by the soft cushioned grip, which is also suitable for medium-sized hands. Use this dough blender for a variety of options, even for making baby food, guacamole or salsa. Choosing a basic kitchen utensil is more difficult than you think. Since they have very simple mechanisms, we tend to be complacent and just pick whatever, often making our final decisions based on the price tag. If you do this, there is the danger of ending up with a dough blender with cheap construction. Thus you get “what you pay for” for choosing the cheaper options. If you want to get great results every time you make pastries, then you have to make sure you use the right tools, and having a low-quality dough blender is sure to reflect on the batch of muffins or cookies that you end up baking. There might also be that soreness or ache around your wrists after you have been forced to use a poorly performing dough blender earlier when you were preparing your dough. That’s why it is important to pay attention to the details. You will find that the best dough blenders have one common denominator: stainless steel. The blades are made from high-quality stainless steel – not just any low-quality steel masquerading to be the real stainless steel. Not only does stainless steel make your dough blender look like it can perform well, but it does actually make it perform very well. Stainless steel blades are known to cut and slice better than more inferior blades or, in all cases, wires. Durability is also a consideration because you want to make the most out of your money. Stainless steel is sure to last long and has greater resilience against frequent use. You have to take note of the handle. First, is it wide enough so that your hand would fit in it perfectly? If it is too tight, the constriction might leave marks on your hands afterward. If it is too loose, then you’d have a difficult time controlling it during the cutting and mixing. Look for one with a non-slip and non-stick grip. Some models have rubber-coated grips, while others cover it with some other soft material that will serve as a cushion and absorb pressure when it is being used. You will find that this is more comfortable for your hands and wrist, not to mention make the dough blender easier to control. Kitchen utensils are often a pain to clean, and the dough blender is no exception. That’s why you have to look for dishwasher-friendly options. The blades are not necessarily sharp. In fact, they shouldn’t be. It’s not the sharpness of the blade that cuts through solid fat; it’s their thinness. However, that does not entirely rule out the possibility that it might cut you when you’re washing or cleaning it. Thus, choose one that will cut through butter or lard, but not your fingers.